One shopper had to search for toilet paper in 6 stores. Another arrived in a supermarket just after a delivery but was limited to a 4-roll maximum. Attempting to deal with its toilet paper shortage, the Venezuelan government has said it would import 50 million rolls. Because the country’s monthly demand for toilet paper is 125 million rolls, I wonder if 50 million is enough. 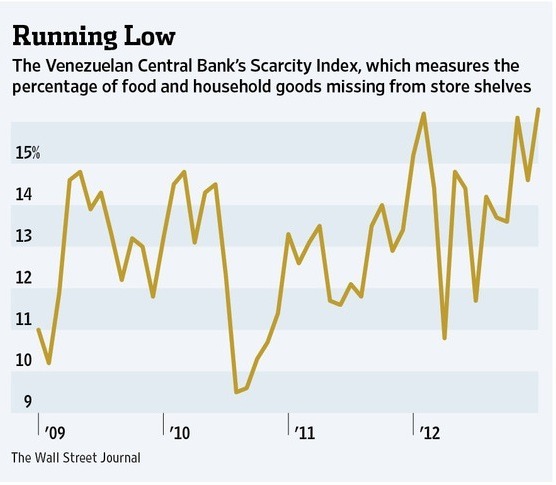 Venezuela’s Central Bank Scarcity Index indicates that shortages of other items like cooking oil, sugar and cornflour are worsening. Just above 21%, the scarcity index tells us that for every 100 goods, 21 are not available in markets. Correspondingly, with an annual inflation rate close to 30%, purchasing power is sinking. So where are they? Venezuela’s President Maduro continues to cope with the perverse incentives that are the legacy of his deceased predecessor, Hugo Chavez. Even the recent increase in capped prices by 20% for several basics like milk, cheese, butter and beef had little impact. The gap remains between quantity demanded and quantity supplied. 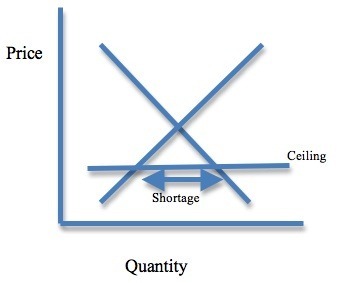 Even with a 20% increase in prices, if the ceiling is below equilibrium, shortages result. Huge transaction costs spent when people waste time searching store after store. Inadequate resources allocated to developing oil wealth. Factories operating way below capacity. Sources and Resources: There are so many articles about the toilet paper shortages in Venezuela. Reuters, the BBC, Bloomberg all had something to say while my Scarcity Index is from The Atlantic. Previous ArticleCompetition: Pick Two, Get One.